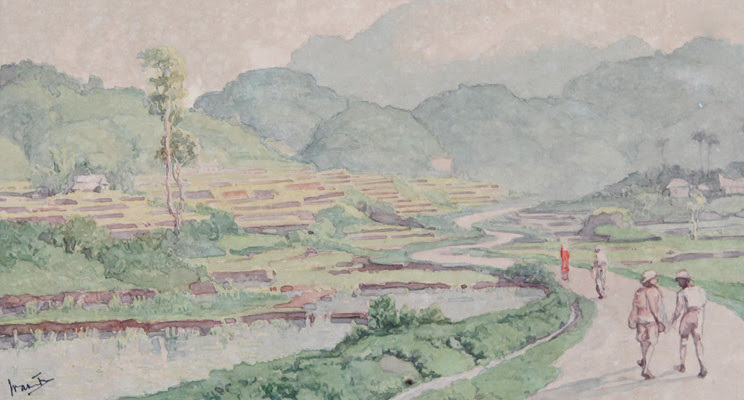 Gajah Gallery presents seventeen works by the late Indonesian artist, Wakidi (1889 – 1979). Formerly from the collection of the artist’s family, these works will be shown in Singapore for the first time. Wakidi’s paintings capture the spirit of the era, embedding the lush Indonesian greenery and details of daily life onto paper with painterly strokes. While European art history and its influences were important to Wakidi’s work, his paintings are widely acclaimed for the marriage of his knowledge of European fine arts with a tender awareness of the social reality of Indonesia. Through paintings and thousands of drawings using pencils, ink and watercolors, Wakidi illustrated the elegance of the Indonesian landscape bathed in light; the beautiful yet mysterious pose of Minangkabau women, and the complex architecture of traditional homes.